Addgene is a global, nonprofit organization dedicated to making it easier for scientists to share plasmids. As a repository, institutions provide us with (deposit) materials for distribution. Then, institutions order (request) materials from us. 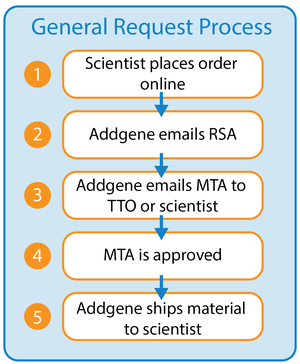 Addgene distributes all materials under the terms of the UBMTA. If you are a TTO, you can find more detailed information in our Technology Transfer Office resource. After a scientist initiates a plasmid deposit to Addgene, we will generate a Deposit and Distribution Agreement detailing the materials and terms for the deposit. Visit our Deposit page for more information about depositing plasmids. If we have an authorized person/office as a contact on file for an institution, Deposit and Distribution Agreements will be sent to that contact. If we do not, Deposit and Distribution Agreements will be sent to the Principal Investigator (PI) to obtain approval from the authorized person/office. 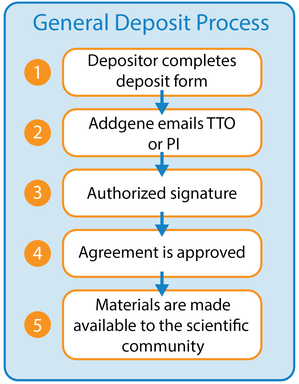 Addgene's Deposit and Distribution Agreements can either be approved through a signature on paper/PDF, electronic signature, or electronic approval through an Addgene Technology Transfer Account. To read more about how to approve materials through an account, please consult our Master Deposit Agreements resources. After you place your order with Addgene (1), we will send you a Recipient Scientist Acknowledgement (RSA) to sign. By signing this form, you acknowledge that you understand the terms of the UBMTA (2). Many institutions require this acknowledgement before they can finalize an official Material Transfer Agreement (MTA), and our RSA satisfies this requirement. For more information about requesting materials from our repository, please see our full ordering instructions. Upon completion of the RSA, as well as any internal forms/questionnaires your Technology Transfer Office has asked us to include in this process, your order’s MTA will be generated and sent for approval (3). For many institutions, we have contacts in your Technology Transfer Office to whom we’ll send the MTA. If we do not have contacts on file for your institution, we will automatically send the MTA directly to you. All MTAs must be signed by someone authorized to do so on behalf of your institution. If you are unsure about who should sign the MTA, please see our Help Center article regarding signature authorization (4). Once we receive the signed MTA through one of the approval options, we’ll prepare the order for shipment (5). Click the link to open and close the video window. If you have trouble accessing the video, please try viewing on YouTube. Find more detailed information for Technology Transfer Offices.